Before I get down to the details of my nomination and my experience of the Nursery World Awards 2014, I need to make it very clear that this a personal recall of my experience, it is about how I felt from the beginning when I was first nominated, through to actual awards evening. Therefore it has to be acknowledged that this blog is not intended to criticise the Nursery World Awards event, or to assume that everyone feels the same, but at the same time is also has to be acknowledged that this will be a honest personal reflection, and so some may feel that I am being critical. There will be very positive aspects, some less positive aspects, and some aspects that for me personally were very challenging. As always – I welcome comments on my blog – both from those who agree with my opinion and from those that disagree. I am a mature person (being over 50), a mother of 4, Granny to 9 (almost 10) grandchildren, currently an Ofsted registered childminder – and with over 30 years experience within the field of childminding. I am also a wife, a volunteer to many organisations, and more recently a foster carer. In total counting birth children, foster children, and childminded children, almost 300 children have been in my care – albeit some for many years and some just for a few weeks. My natural persona is one of lacking confidence, quietly spoken, honest, caring – and having a passion for my chosen career within the field Registered Childminding – and more importantly for not just the children I personally care for but for all children. I am not the sort of person to complain if a meal out is not to standard expected, I am not the sort of person to take something I have brought back, if it is not fit for purpose, I am not the sort of person to negotiate a better price for something. Even within my setting practice I am not the sort of person to insist on notice period being given and paid for – my setting documentation states very clearly that notice period is required to give opportunity for the child to have a smooth transition, if parents choose not to give much notice to enable this transition, I do my best with the time period available. So where the rights of children are concerned, my personal ethos and principles will not let me remain quiet, will not let me just mutter under my breath or have a bit of a rant at close family or friends. Therefore I find myself with a rather well worn ‘soap box’ on which I stand on to ‘shout’ about all the things, that I consider to not be in the best interests of the children. I do so, despite the stress this causes me personally, despite the ill health it results in (not least from trying to fit so much into my so called spare time), and despite feeling that often I am speaking to a brick wall called Government . In recent years I have had more and more things to shout about – and in doing so I have made contact with others who feel the same, and who are also speaking up for the rights of the children, in their own ways – some quietly and some as loud if not louder than I do. Those of you who have not read one of my blogs before, and maybe do not know what it is that I campaign about – please take a few moments to look at some of my other blogs on here, or try googling my name, or Penny’s Place Childminding. Some colleagues suggested that it would be a good idea to enter the Nursery World Awards to raise awareness of my campaigning work , and to acknowledge everything that I do, from my hands on childminding, to my support of colleagues through training and information sharing, to working in partnership with other individuals and organisations – and challenging Government. I am now going to add my nomination paperwork here – not because I am having a big head moment – but because I want people to see what those who supported me said. In doing so I hope to help people to understand what it is I do, and why I do it – and therefore to help raise awareness of my campaigning and an awareness of who I work in partnership with. I think it is important that everyone works together in partnership on aspects that agree with – as this will have the greatest impact. Of course we are not all going to agree 100% of the time on 100% of the issues – and when we don’t agree, I think it is fine to disagree on those aspects. The links are just have a title and are numbered – so if possible read them all and in order – although I accept that some readers won’t have time to do that, and will just scan read, or read the bits most relevant to them. Document THREE Making a difference to children ..
For those of you who don’t have time to read the above documents, I want to give an insight into the other professionals who supported my nomination – this is important as it shows how many are not only working with myself but with each other – maybe other on reading the documentation will want to join us – may be those who work with one or two of those that I am about to mention, will now want to work in partnership with more organisations and individuals who share the same concerns about the well being and rights of children. And then just when I thought I had not been shortlisted, I found out that I had been, I was delighted. I had been shortlisted for the Individual Outstanding Contribution Award – I have to admit I had a huge grin on my face for the rest of the day – this was just what I wanted – some publicity for my campaigning. However, I have to say – I was a bit disappointed because as the weeks marched forward toward the actual awards event, there was no pre event information about those who had been shortlisted. I understand that it is expensive to print information in the NW magazine – but I had hoped that there would have been some information about all of those who had been shortlisted available online – so that everyone could read about their achievements. Maybe I missed it – and there was some – but I did visit the awards page on NW website several times, I did not see any information – other than a list of names. I did however receive ‘official’ confirmation of being shortlisted and a request that I book my place on the online booking form. I have to admit I had to think about this, as the Nursery World Award event is a Black Tie event, very glamorous – and to be honest, way out of my comfort zone. Of course some people love this type of event and really look forward to dressing up, celebrating and having a fantastic time – but not me. In the end though, after thinking about it and talking to close friends and family, I though I should go because there would be networking opportunities. So I went online to book my place – and at that time not even thinking that as a finalist that I would be expected to pay to attend. I was in for a shock – I did have to pay – but I was relieved to see I was booking in time to take advantage of the Early Bird price – which was £160 – a huge amount for someone like me – who like most early years practitioners does not earn a great amount. To put it some sort of perspective – my weeks family holiday – for myself, my husband and my foster child cost £160 – and yes we did have a few extra expenses such as spending money, travel to the holiday and so on, but the actual holiday was £160. And I was about to find out that attending the Nursery World Awards event had a few extra expenses as well – starting with VAT being added to the ticket price. Therefore my ticket cost £192 – and at that price my local friends and my family members said – sorry but we can’t afford to come with you – and I certainly could not afford to pay for them. But that would have been complete waste of money that I can not afford to waste – and the reasons for going were still valid. I did start a discussion on Linkedin – as I thought that some everyday practitioners like myself may have similar difficulties in affording to attend or in attending an event outside their personal comfort zone. Response was mixed, but Nursery World have said they will consider other options – although they think from previous feedback that most people prefer the type of event provided. That may well be the case – and it proves that I am in the minority, then of course the event should continue in its present format. However, if it proves after consultation that others also would like some changes made, then I trust Nursery World to consider changes. I was getting myself into a state of stress about the whole thing – even those who know me, struggled to understand how someone like me, who will challenge Government, attend meetings at all levels – and write blogs, could possibly be so nervous and so stressed about attending an event such as the Nursery World Awards. Meanwhile, unknown to me two of my London based friends and colleagues were emailing each other, and basically saying ‘ We have to do something – Penny is going to ‘bottle out’ and not attend’ – and so they spoke directly to Nursery World – and despite it being a bit late in the proceedings, secured tickets for themselves, and a promise that they could sit at the table with me. I can not thank Bea and Jen enough for going to the personal expense of doing this to support me. My eldest daughter Michelle, then stepped in to organise and pay for a hair cut – again I am very grateful. My husband Garry (better known in this blog as Mr. Penny’s Place) brought me a suitable handbag – and I was more or less sorted. Before I knew it, the time arrived to start preparing for my journey to London – and in the middle of the night in the week before the event – the dress crisis hit me! I had been expecting this due to my lack of confidence, and lack of experience of this type of event. So I looked at photo’s online of previous years events – and felt worse – would I be over dressed or under dressed? – and why did I think a £16.99 dress from Ebay was going to be suitable? Friends and family poured reassurance on me – my dress was not just ‘fine’ it was prefect. Early on Saturday morning, having not slept much the previous two nights – I found myself on the 6.37 am train from Kidderminster to London – nerves were getting the better of me – and my digestive system was working over time! Social media played an important part in providing constant reassurance and support during the journey – thank you everyone. I arrived at Marylebone, and was very grateful to find that the disruption to underground services was not going affect my journey to Victoria where I had arranged to meet my good friend Wendy. Wendy and I chatted a few hours away over two cups of coffee each, then it was time for Wendy to head home as she needed to rest before taking part in the Shine walk that evening, and I had to head toward my friend Jen’s house where I was staying. It was at this point that the underground disruptions impacted on me! Wendy pointed me in the right direction, we hugged and kissed – and then I was on my own. I am fairly confident on the tube system now (after many campaigning trips to London) but I was not prepared for this – too many people for tubes and lifts, stairways closed off, and a lot further to walk – all carrying my large suitcase (that I joked contained fairy godmother, pumpkin, mice and so on – as per the story of Cinderella). I finally get on the final tube of my journey to Jen’s – along with rather a lot of Chelsea supporters on their way to a match – they were not an issue – other than there were a lot of them all determined to get to the match on time, so they all squeezed into the limited space. I arrived at Jen’s hot and tired and stressed about the forth coming event. Jen provided coffee and cake and chat which helped to keep my mind off things a bit – but then it could not be avoided any longer, as our shared friend and colleague Bea was due to arrive in 30 mins! Dresses and shoes were put on, hair quickly sorted (and in Jen’s case some make up applied) and we were ready! I felt fairly good about my appearance and comments from Jen, and Bea who had just arrived, help boost my confidence even more. By now I was a nervous wreck – and so grateful that Jen and Bea were going with me – I am sure it is difficult for those who enjoy such occasions to understand how I felt – but I felt physically sick and if it was not for my friends I would have not gone. We found a space to stand in the huge room that was slowly filling with people – all dressed in their finery. I know if I had gone on my own and had got as far as the reception drinks – I would have left fairly quickly. It is amazing how lonely crowded places can be if you are stood on your own. Jane (Vice Chair of Pacey) came over and had a chat – and told me what to expect – as she has attended these awards before – thank you Jane. They ensured I made it back to the drinks reception and we went back to chatting together and people watching. We were spotted by Neil Leitch, CE of Pre school Learning Alliance, who came over to speak to us all and as a supporter of my nomination to wish me good luck. We were then all asked to make our way to dinner as it was about to be serve, on the way up the stairs, I had a quick chat with June O’Sullivan but then she made her way to her table with her staff from LEYF. We stood for a while looking down on the room before making our way to table 38 where we found our places. As promise Jen and Bea were sat with me – one either side. The rest of the table was occupied by lovely people from Springboard Opportunity Group in Wiltshire – it was touching that as not all their team could be with them, that they had printed photo’s of their colleagues, and so their present was felt at the event. Alarm bells started ringing for me as I noticed that my dietary requirements were noted as ‘normal’ for starter and main – but different for pudding. Still there was no way I was going to make a fuss (and I had communicated about my dietary needs at time of booking and a few days before the event)- and when the starter arrived which was totally unsuitable, I just nibbled on a small slice of bread. However Bea had other ideas and called over a waitress – she explained about my needs – and in a short space of time chef arrived so I explained to him. A second starter was served – again unsuitable – but finally at third attempt a suitable starter was provided. Chef checked my requirements for the main, and I was relived to find that when the main was served it was suitable. I can not fault chef on this as it appeared he had not had notice about my email until that morning. The point I would like to make though is having provided details, I should not have had to deal with my dietary needs on the night – or rather Bea should not have had to. If I had been on my own – and had managed to stay until dinner was served – I would not have made a fuss and as a result would not have been able to eat the starter or the main. I question why at such events there is not a choice on the menu – I understand the difficulties of preparing and serving meals to so many people, at the same time, but if there was a choice, people could pre book, especially as there is clearly a system in place to record what people have requested. Chat round the table during dinner was very pleasant and friendly. Others at the table drank some of the wine provided at the table – and as a non drinker, I wonder why wine is included in the price especially as there will always be people who don’t drink, and people who drink more than others. As a soft drinks drinker I have a choice if I buy a soft drink or not ( and on this occasion I just drank the iced water on the table), so why don’t wine drinkers have the same choice – to buy or not to buy? And I am sure it is not just the Nursery World event where this needs to be considered. or fruit juice was provided at tables as an option. After dinner Dave Benson Phillips was introduced and he quickly got down to the job of ‘entertaining everyone. I like Dave – and so don’t have a problem with him being chosen – but in my opinion there were a host of people present who are well known in the early years field, who I would have preferred to introduce the winners and to say a little about the awards and what the judges were looking for in each category, and what was special about the winners. This in my opinion would have also been better than the voice over information about the winners. We were entertained by a chap who I had never heard of – and who I would not choose to see perform again – but that is personal choice – and you won’t please everyone all the time. It was then time for the actual awards – my stress levels started to go through the roof, both Jen and Bea noticed this and asked if I was ok / put a hand on me, every so often. I suppose like others who have not attended such events before, I had made a few assumptions about what the event would be like – and certainly from what I had been told about previous events, and from following on Twitter last year – I expected a real celebration of all the achievements of everyone in the room – after all everyone was a finalist and that in its self is a major achievement – especially as we were told there had been over 300 entries. I have to say I was really disappointed with the event as a celebration – there was no deigning that it was glamorous event – the table settings were lovely, everyone had made an effort to dress for the occasion – but I did not feel that the event did justice to those who were finalists or winners. But that is just my opinion – I am sure others will have felt it was celebratory and that they felt their achievements had been valued. To explain this is why I felt that the event was not a celebration – maybe it was just me, maybe it was just this years event – but I was disappointed. Dave introduced the finalists – in that their picture and name was flashed onto the screen for a few seconds – the Highly Commended were then mentioned by name – but they did not even get to go up on stage – and a certificate was just taken to their table. In my view hardly celebrating either the achievements of the finalists for each award or those that were highly commended. Then the winners were announced – they did get to go up to the stage – and there was a voice over about them and their achievements. They were presented with their award, the photographer quickly took a photo and they left the stage whole thing taking on average around 5 mins, because as soon as they left the stage, the whole cycle of announcing names started again. All well and good but what I observed – was that as the night went on there was less clapping from other tables – yes the winning teams jumped up and screamed and clap but others in the room were less enthusiastic – Dave was doing his best to get people to cheer and clap – but those in the room were not engaging. I have a theory about this – you see I think those who were not winners were not only disappointed but a bit deflated about how they and their achievements had been more or less dismissed. Certainly a table near me that was not a winner were very quiet once they knew they had not won. By the time the first few awards had been given out people were not really even clapping much when the finalists for each award were announced. By the time it got to the award that I was nominated for, there was hardly any clapping going on apart from the tables were winners were sat. I personally felt what a wasted opportunity – surely all the finalists needed to hear people congratulating them when their name was announced – surely they wanted people to know what was special about them and why they had been nominated and short listed by the expert panel of judges. I was further disappointed when my picture and name flashed onto the screen for those few seconds – no one looking at it would have a clue that I was a campaigner – it looked like I had been nominated for something connected to outstanding contribution in my setting. In fact I had sent a range of photo’s in showing me in my various roles (complete with notes about what each photo was) – and the one chosen was of me with one of my grandchildren at THEIR house, so it was not even one of me in my setting (there were photo’s of me in my setting and in campaigning mode sent in). I did not win, nor was I even highly commended – not only was I naturally disappointed, I also felt that entering had not achieved my personal aim of raising awareness of my campaigning – I had not entered for personal recognition as me, only as a campaigner in the hope that more people would come together to stand up for children’s rights and their well being. Still, as I sat there reflecting I thought about the networking opportunities, and about the booklet we had been told we would get at the end with details of the finalists in it. However, again I was disappointed – my name is listed as a finalist in the booklet – but no one will realise what I was nominated for, and the opportunities for networking were there at the end – but the room was filled with tables, the dance floor small for the number of people, and unless you are a very confident person you are not going to go up to people you recognise but don’t know and say ‘Hello’ – and even if you did, the opportunity to chat was limited due to the dance music. I did get chance for a few words with Neil Leitch (together with Jen and Bea) and he kindly agreed to the photo below being taken and shared . Bea, Jen and myself decided it would be better to get a taxi back – before midnight – which we did – noticing that we were not the only people leaving at this time. 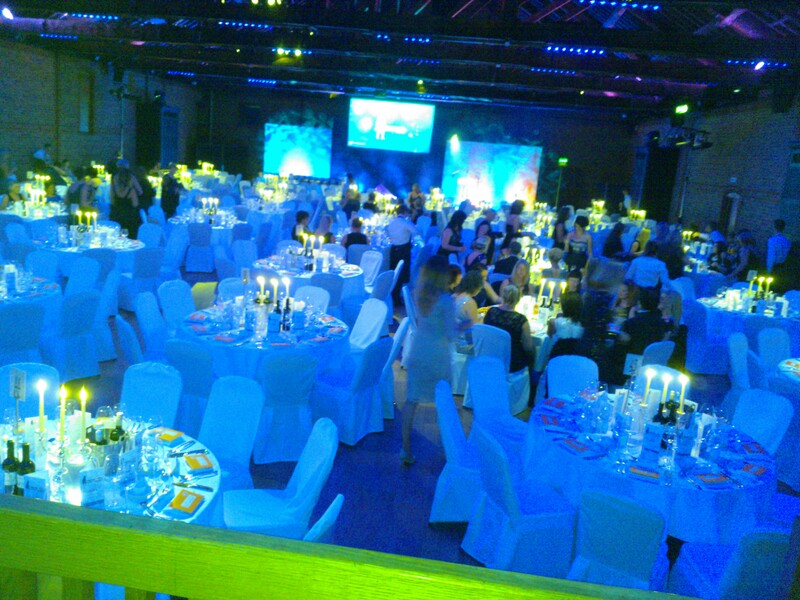 Would I attend again – In its present format, I don’t think so, but if Nursery World consults and makes changes that reduce the costs and really celebrates the achievements of those who are finalist – well who knows. I have made a couple of suggestions within the text of this blog but as I have said that I would be happy to help Nursery World evaluate and reflect on their event so that they can consider changes – here are all those suggestions in one place – plus a few others not mentioned before. Consider holding the event somewhere outside London, as venues would be less expensive, travel distances would be reduced for many, and hotel costs for those needing overnight accommodation would cost less. Consider providing information about all the finalist either while doing the presentations or in written format on the table at the event. NB Because I am always honest and fair – I need to mention that finalists do get a certificate and mine is on its way. So this point does not need considering as already in place. Thank You Nursery World. Consider how to ensure all are applauded at the event – not sure how to do this but maybe it could be led by the panel of judges if they sat in view and clapped everyone? I do not claim to have the answers, about what to do, if consultation shows that people would like change. All I know is it never hurts to reflect, it never hurts to consult and to listen to the views of others. And it never hurts to say – I / we have reflected, we have consulted and now we know we need to make changes – or now we can continue doing it as we were because change is not needed at the moment. I must make it clear (due to comments made) that I am not questioning the judges decision, I fully accept the judges decisions which are based on their professional opinion. Those finalists that were picked as winners or highly commended were picked because they were considered the best entrants. Posted September 29, 2014 by psw260259 in Random Things! So AFTER the publication of the childminder agency Ofsted Handbook – and the DfE Step by Step guidance for setting up childminder agencies – we now have today 5th September the evaluation of the pilots – or as DfE prefer to call them trails. I have awaiting the publication of this report with interest – I wondered what it would actually say – and if it would correspond with the informal feedback that I have been getting over the last 6 months from various sources. I wondered if there would be anything that suggested as a result of the pilots, that had indicated that childminder agencies were needed, or would offer anything that had not already been tried before / was available elsewhere. In general, I was doing a lot of wondering.  provide help for parents in finding a high quality childminder. Interesting I think – they ran a pilot on some aspects of childminder agencies – and yet because no services were provided they have not been able to really test out childminder agencies – and so cannot come to any firm conclusions. And I am not just saying this without any thought behind it – I have taken part in enough pilots – those for quality assurance schemes, those for changes to Ofsted inspections and so on – and in every case those taking part did everything required – so complied a portfolio and went through a quality assurance visit and had feedback; or took part in an inspection with feedback and report. In each situation the outcome was not valid / legal, and in each case ‘fine tuning’ was needed as a result of the pilots – but at least everything had been tested. Not so for childminder agencies – and as far as I am concerned there was NO REASON why fully functioning agencies could not have been piloted (but without cost to those taking part, with the current inspection framework and support still in place) – WHY? I have to ask – Why did the Government not want to test childminder agencies out properly before rolling them out? To me it is a bit like drawing a new model of a car on a piece of paper – saving lets do x,y and z. Testing those parts individually – and without ever putting all the components together launching the car and letting people drive off in it, without knowing if it all works together or if it is safe or if there is public demand. So why are more people not jumping up and down and protesting loudly about childminder agencies? After all these agencies are about the care of children and are now legal – without any proper testing. Page Six – It is noted that there was negative media and concerns from existing childminders – and whose fault was that? – yes the Government for not giving details, not answering questions and to be frank not conducting ‘proper’ pilots. The pilot activities are listed – sounds quite good – but some of these were paper exercises, some of them were discussions. In fact most activities were of the ‘Consideration of’ or ‘Exploration of’ type – and if you don’t believe me – take a look at Annex Two. In exploring how areas of the policy may work in practice, the childminder agency trials have played an important role in policy development. Learning from the trials has helped to inform regulations for childminder agencies and ‘departmental advice’ on childminder agencies. REALLY – Having read the documentation mentioned – all it seems to have done is ensure that the guidance and regulations are as ‘loose’ as possible with lots of words like MAY, MIGHT and COULD. There is also mention of the business costs – and in so many words it says that you need to do some Market research! WOW now isn’t that enlightening? Surely they should have more to say than that? Some examples maybe? Some actual costings maybe? There is an example given that says how engaged with childminders – but the only thing to have come from that is to say that some childminders may wish to buy services such as training from an agency – Now that is a surprise – of course they will – IF the price is right and the time right. Oh and they showed the childminders how the agency costs could be offset through their tax returns! Another astounding piece of information – most childminders are well aware of offsetting expenses against their tax return – but maybe it was new information to the DfE? In then talks about ‘new services’ – Now I am getting cross – these are not NEW services – they are already offered through various schemes – clearly more re inventing of the wheel – but what a joke they make it sound like they have come up with some really good suggestions – but they haven’t – been there, got the T-shirt! Page Twelve – Has a box with examples of these new services – why didn’t they ask membership organisations, social services and LA’s who already have these in place? Why did they not ask me? Page Fourteen – All about recruiting new childminders – think they may have copied and pasted from a LA / membership organisation website – it is all ‘old’ information – we did not need childminder agency pilots to find out any of this – we already knew it. Consideration may need to be given to separating within an agency the support and quality assurance functions of an agency to minimise conflicts of interest. The rest of the document is just the Annexes and list of who took part. So there we are are you any more informed? Are you reassured? ……during nap time, when I could be doing many other things related to my childminding setting – washing up from snack time, cleaning the floor after snack time, putting on a load of washing of those lovely washable hand towels, updating children’s records, reading one of my professional magazines, starting to put together the weekly parents newsletter, doing some background reading for my degree, cleaning toys, – oh and so many other things that as a sole practitioner I have to fit into every day – as well as the 11 or 12 hour working day ……. …… I find myself lost for words – and regular readers of this blog will know that it is not often that I am lost for words. When you add this to my inspection experience, where one of Mr. Wilshaw’s Ofsted inspectors did not do their job, where on complaining about it, I got fobbed off, not listened to and not believed – and now I am ‘stuck’ with a good grade (which if it was based on my practice I would be proud of) and recommendations that I don’t understand how to implement (because not based on my practice, and worse are already part of my practice) – you will understand that today, I am seriously considering my career options. It seems to me that while Mr. Wilshaw is the Ofsted chief – childminding is not valued, not given professional respect – and from today’s comments would seem that not even wanted as a choice for parents needing childcare. However – I love my job – that is the hands on work with the children, and working in partnership with their parents, and with other professionals – so would I find a job that I loved as much, and one in which I could hand on heart say – would make a difference to the children of this country? I first became aware around breakfast time – when colleagues started to contact me and highlight this article – Facebook was unusually busy with comments as childminders read the article and then commented – the feelings being expressed were similar to my own. Twitter than became another platform for people to express their shock and disbelief that Wilshaw had said these things. And I agree – how can someone in his position – Chief of Ofsted who are supposed to be an independent regulatory body, not influenced by political leanings, make these sort of comments? Ofsted are supposed to make judgements on what they observe . Even though a few don’t – most do, but what will they do now in light of these comments by Wilshaw. My own observation is that Ofsted seem to be unable to recognise Outstanding childcare and education when they see it – yesterday I had a call from a childminder (and she is not the first) asking if I would advise she complains because her inspector could not think of a recommendation – yet the inspector said she was grading the childminder as ‘good’. Surely if her inspection notes do not identify any areas for improvement the childminder should be outstanding – and not asked to make her own recommendation? The cynical side of me says that inspectors will find it hard to justify giving a childminder a outstanding grade when Wilshaw has said (in so many words) that childminders are not good enough. And I can just imagine how if any childminder made such sweeping discriminatory remarks about children, or families or other professionals – would be treated – yes they would have the regulation book thrown at them – so why is no one throwing the regulation book at Wilshaw? I could say so much more – but I would find it hard to do so without stepping over the line of professionalism – and although Wilshaw is prepared to step over this line – I am not. I am well known for my comments about the current Government policies and proposals for education and childcare, and in particular early years – which as we all know despite being a coalition party – is really mainly Conservative polices – and governed by the need to save Government money, and increase tax revenue. I guess some readers many think it a little odd that I am commenting against proposals that could technically lead to more work for myself as registered childminder – and for colleagues across all types of early years settings. However to my colleagues it will not appear odd – and this is because (and it maybe a shock to Government and opposition parties) I (we the early years sector) actually care about the children and their families, and want to provide the best possible start for each child – as appropriate to them. This means that each child and their families needs will be different. We are not talking about parcels that can be moved around for best fit, and efficiency; we are not talking about storage solutions for those boxes; or redesigning so fit the system better……. WE ARE TALKING ABOUT CHILDREN – real live humans – not even mini adults, but children with their own unique development needs. It may also surprise Government and opposition parties to know that most early years setting are not really in childcare just to make money, they are in childcare because they want to improve outcomes for children and support families. Of course they need to cover their costs and even to make a small profit to ensure they are sustainable, but the most important thing is the well -being of the children. But even the most dedicated early years professional do not have a magic wand to to pay bills that they they just don’t have the money to pay; to continue to cut cost when there are no more to cut without impacting on the care of the children; to achieve the possible without the funds to do so. However it should not be a surprise because early years settings have been saying for over a decade that the funding provided by the Government for funded early years education places (and funded has had several names over the years) is simply not enough – and so early years stetting have been subsidising this out of their profits – and in some cases out of owners own pockets. Early Years settings would love to pay their staff more – and owners would like to be paid for the hundreds of hours they put in every year that are unpaid. However they can’t, if they did they would be bankrupt within weeks – and that would mean closing settings – something that caring early years professionals will avoid if at all possible. Early Years settings would love to be able to give their staff paid time off to undertake further qualifications and CPD – and indeed to pay for those qualifications – but can’t because usually they simply cannot afford to do so – and so many early years staff end up doing qualifications in their own time – and sometimes at their own expense. And all because the Government do not pay enough for funded early years places – shocking but it has been going on FOR YEARS. The trouble is that every time the Government increases the number of hours funding per child, or lowers the age at which a child can access the funding – the worse it gets and now early years settings are saying – we just can’t do this subsidising any more. Which means the Lib Dems proposals will worrying to early years settings and possibly if implemented, will be the straw that broke the camels back. And not just the Lib Dems plans – remember Labour and the Conservatives also want to increase the number of funded hours. It would be nice to read about proposals that actually considered this aspect of sustainability for early years settings instead of, just expecting more and more from those least able to afford to do so. In other words provide a funding rate that covers the true cost – which is higher than both the current funded rate and the hourly rate charged by early years settings – as neither cover the true cost, if all the hidden costs paid for by staff and owners were took into consideration. There seems to be an assumption within political parties that all adults should be in work and indeed would preferred to be in paid employment outside the home. There also seems to be an assumption that all families want a place in an early years setting for their child, and indeed that all children will ‘do better’ in a childcare setting than at home with their parents. The trouble is this blanket approach is wrong – so wrong – and what is it based on? Some cherry picked bits of information, a huge amount of assumptions – and a ‘We know better than you’ attitude. For a start – not all adults want to work and put their children in childcare, and the silly thing is research shows that for most children being at home in their early years is the better option. Many parents would prefer to stay at home with their child but family finances mean they have little or no choice. I agree that for families that only have one wage earner – even a small amount per week would make a huge difference, but in my opinion what we need is some of that radical ‘thinking outside the box’ stuff – because we pay out huge amounts of money in different benefits – we also pay out huge amounts in providing the admin side of these benefits, we tax people to give it back to some but not to others – it removes personal choice and traps some in poverty, and generally does not work. So how about we enable people to stand on their own two feet and make their own choices about if they want to work, or if they want their child to use childcare and so on. I don’t have access to Government financial figures but I have seen enough personal cases to know that some families get too much, some don’t get enough, some get financial help but not the support they need. As I don’t have access to the figures to do the sums – here is a stab in the dark – but maybe a starting point? Of course I really don’t have any idea about such things – I am just ‘waffling’ BUT what I want is for some one (political party / think tank) to think outside the box / to scrap what is not working and come up with a radical vision that works for parents, children – and the country as a whole. Scrap early years funding (Shock – horror – but you have to start somewhere) – but instead ensure parents who work can afford to pay for childcare …..
…….. Raising minimum wage to an amount nearer to a living wage – say £9 per hour (this would of course include early years practitioners) I realise that this in itself would put up childcare fees …..
…… so scrap VAT or at least half in first year / then scrap in second year – it costs every day people a lot of money – what people want is support with the cost of living – scrapping VAT would help everyone. Who knows people would buy more items and boost the economy this way – or they may be save more in pensions and so on. Whatever they do, the individual would have more money in their pocket and more choice about what to spend it on. The benefit system when fist introduced was never intended to do what it does now, so we need a complete rethink – and although I know there would be difficulties moving from one system to another, it is just a case of thinking about how this can be done. So how about it political parties – will you be the one who puts forward proposals for real change? There is not a lot more that I can say on this that I have not said before – and that many other academics, parents, practitioners, membership organisations and experts in the field have already said. What we need is choice for parents so that they can choose what is best for them and their child. For some it will be a playgroup, for some a nursery, for some a childminder, for some a maintained nursery class, – and for some being at home with their parent. For some children – 15 hours is about right, but for others more hours or less hours would be right . For parents it is even more complicated – some need mornings, some lunch time, some evenings, some just to cover over lapping shifts, some 7 days a week, some just now and then. If parents had real choice in where and when to use to childcare – including the option not to use childcare – then the needs of children would be better met – not prefect as sometimes the needs of parents conflict with the needs of children – but it would be a step in the right direct. Parents need money in their pockets to spend on the things they need – childcare is just one of those things, for some but not all parents. In my last blog about the Ofsted Childminder Agencies Handbook CLICK HERE IF NOT READ YET , I commented that the DfE had not published any new information – despite saying they had. Well it seems I was a little too quick off the mark – and looked before they had had chance to do so! So I expect you are all wondering the same as I was …..
…… Is this the document that sets out those robust regulations and requirements that will reassure those who are concerned that Childminder Agencies will not be high quality and will not achieve the Governments admirable, but ill thought out aims? Is this the document that sets out expectations about services and level of support? In fact, I have to admit that although I read the first few pages very carefully by page 8 (of a 47 page document) – I had lost to will to read in depth any more – and just scanned the pages – in the hope that some reassuring words would ‘jump off the page’ – but they didn’t. Why – you may be asking? You may be saying ‘But Penny, we rely on you to unpick and digest and translate Government documents into easy to understand language – surely this document is vital – and we all need to understand the ‘MUSTS’ and the ‘SHOULDS’ ……….. Hang on, HANG ON …… I am sure that was to be one of the main selling points – cover for holidays, and illness, and other emergencies. One of the things that I personally thought – well that would be good and reassuring to parents. However, I could have told them that providing emergency and planned cover is not easy or cheap – you see as a ex CCF Childminding Networks co-ordinator – I KNOW that to provide this sort of cover you need childminders who are happy to provide this service and not fill all their places – but of course this means a loss of potential business, and therefore income. I mean would you like to sit around with no income just so every now and then you could provide back up cover? I know it would suit a few people – but not many. So the only viable way to do this is to pay that person to keep places open – and that costs money – lots of it. And of course SOMEONE has to pay. Now let me see would that be the agency owner out of company expenses – well maybe but guess where the money would come from YES – OF COURSE from the fees paid by childminders and parents using the agency., thus making it more expensive for everyone – well everyone except the Government or the agency owner. So to be clear agencies MAY provide back up cover. SORRY? MAY want to? Again I thought that was going to be one of the key things about childminder agencies – that they would support those wanting to become childminders by providing everything they needed – I seem to remember the phrase ‘ONE STOP SHOP’ – everything in one place, no need to trawl the internet and training providers, and not to mention the much talked about cost saving by dealing direct and bulk buying of services. So again to be clear agencies MAY provide the training for mandatory requirements. I am sure by now you are thinking – BOY Penny, I am surprised you got to page 8 – page 6 alone is depressing enough! I have to agree – although I now have some sympathy and empathy for Ofsted – it must have been really hard to come up with requirements for childminder agency registration and inspection within the criteria set out in the DfE step by step guide. All I can say is – for goodness sake – if they don’t it will be the uniformed leading the uniformed in the case of prospective childminders and the informed (the experienced childminders) leading the uniformed agency staff. I am really sorry DfE – but where is the quality in all this? Just how do you imagine that standards and outcomes are going to rise? ‘Agencies MIGHT also help arrange insurance cover for their childminders – well if they don’t – who is going to provide cover for childminders with out an individual Ofsted number, without a grade or report that gives at least some reassurance that they are meeting the requirements and keeping children safe? Childminding agencies MAY choose whether or not to register childminders and other providers. Where an agency refuses to register a childminder, the decision CANNOT be appealed. So there we are, if they think there is not enough business in the area (or any other reason) they don’t have to register you. The document says refusal is not indicative of a persons suitability – can we be sure of this? Can we be sure that it won’t be a case of ‘Mates first’ or ‘Face doesn’t fit’? I don’t know but I would have preferred a system that stated clearly why a person had been refused – not just to ensure equality of opportunity but for Safeguarding reasons and to ensure the unsuitable, did not just go round all the agencies till they found one that would take them on. I apologise if I have upset anyone with my negative comments – but I can’t help feeling depressed about all of this. We had access to training from various sources – and most understood that LA training could not continue to be free and that we would have to start paying (in fact some already were) – but again on the whole in worked and there just needed to be a bit more across area consistency in availability and cost. Of course the agency route may suit you best – but please at least do your research and comparison because an agency childminder is not the same as a independent Ofsted registered childminder.